— and we’re biting our nails a little! People have been generous and awesome with their pledges and with sharing on facebook and twitter, but we still need almost $3000 before we can call it a success and start fulfilling rewards. That’s one of the things that bums me out the most when I think about not reaching our goal – it’s that we won’t get to make the physical hardback books and the art prints and the t-shirts. So for those and a bunch of other reasons I sure hope we make it! The rewards are going to be great. We held the Draw Mighty Yeti contest and got 29 awesome drawings of our Yeti, and had three winners when we drew names from a hat: Max, Ava, and Sebastian. They’ll all be getting their felt stuffed Yetis in the mail soon! And we made a video to go along with the drawing of names which is posted inside Kickstarter Update #5. It was also on Facebook, but it seems Facebook is very particular about using copyrighted music in videos (I used a song from the 40s, but I guess I missed public domain by a few years.) So they pulled it. And not just the video inside the post, but the whole post! Oh, Facebook. They are enthusiastic about their rules. As promised, here’s the Q & A with Lina, the maker of the stuffed Yetis. She’s very talented and nice and lives in Bulgaria. If you’d like a custom felt toy sewn, send me an email and I’ll give you her info! Q: Where do you live and how old are you? A: I live in Bulgaria and I’m 27 years old. Q: How did you get started making stuffed felt toys? 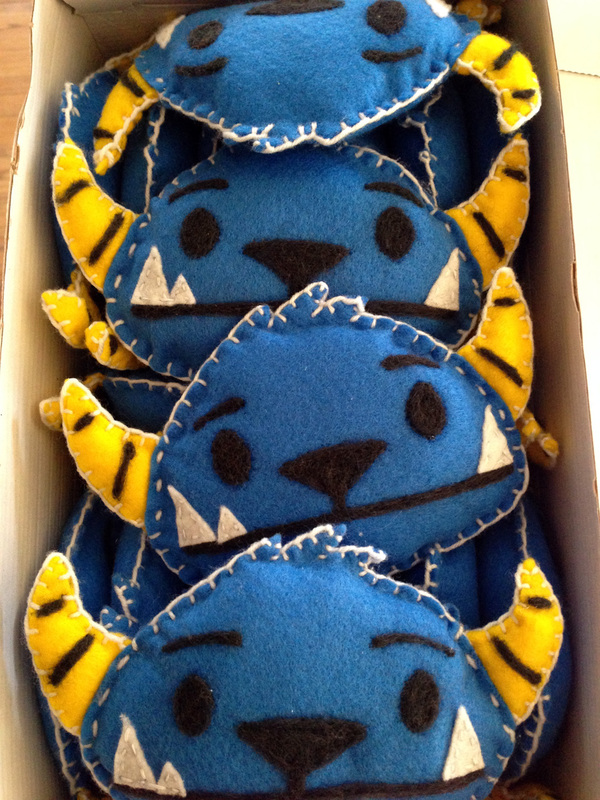 A: I started making stuffed felt toys few years ago just for fun. Q: Are you a seamstress? Do you sew other things? A: I’m not a seamstress, I have never studied how to sew. I just discovered I really like making toys and decorations from felt. Q: Do you make other kinds of art? A: I do, I deal with handmade jewelry and making specific objects by request. Q: Where do most of your clients come from geographically? A: Most of my clients come from the USA and Australia. Q: What’s your favorite thing you’ve sewn? A: I really couldn’t say, as all the things that I sew are pretty much unique. I put a lot of emotions in each one of them. Q: What is your favorite children’s book?